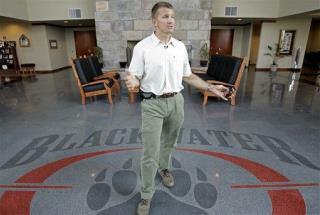 (Newser) – The company that used to call itself Blackwater has agreed to pay $7.5 million to settle allegations of illegal arms and technology trafficking. Investigators charged the company—which changed its name to Xe and then to Academi—with 17 violations, including illegally possessing unregistered automatic weapons, lying to US regulators about weapons provided to the king of Jordan, exporting satellite phones to Sudan, and illegally shipping body armor overseas, reports AP. The fine comes on top of a $42 million settlement the security firm agreed to with the State Department in 2010. This shows the corruption that has taken hold in the kleptocracy we call America. If, as the Supreme Court would have us all believe, that corporations are people then there should be jail time not penalties. All mercenaries are dangerous lying shits.